This post has been contributed by Guest Blogger, Matt. I have never looked through my grandmother’s recipe box. As a matter of fact, I’m not even sure I have ever seen it. So when Wendy and Amy asked me to be a guest blogger with some of my recipes, I wondered how I could help. One thing I love to do is cook outdoors. From grilling, to an open fire fish fry, or even making our Thanksgiving dinner over the fire, I enjoy being outdoors when I cook. The more of the meal I can do in the open air, the better I feel about it. My grandpa was a master griller. I remember helping him make his secret sauce for what he called “Denver Steaks.” He never told anyone how to make it. Not even me, while I was helping him. “A little bit of this, and a little bit of that.” was all he ever said went into it. I guess I inherited his neglect of writing down recipes. I seldom write down what I make, but I always remember what I put into a recipe. So when I was asked to write up a kabob recipe I made recently, I was a little bit worried about getting all of the measurements right, but I did my best. 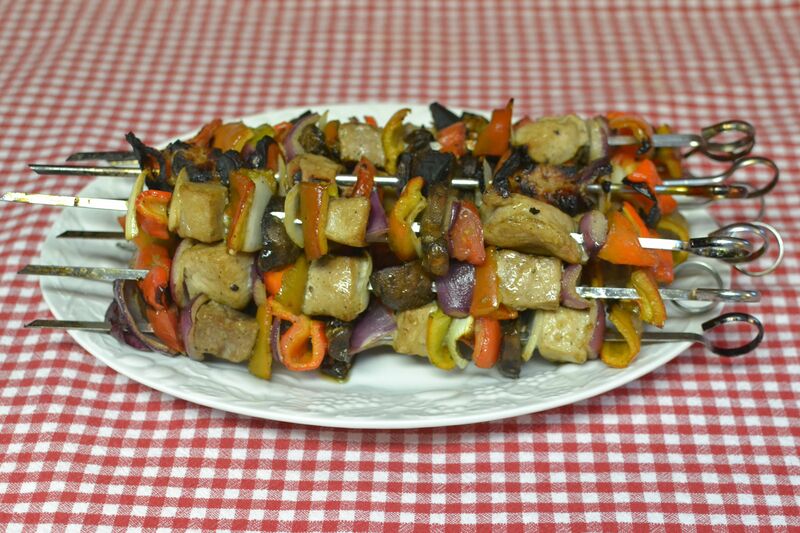 These kabobs can be made with any kind of meat you would like to grill, as well as any veggies you have that are big enough to go on a skewer. I happened to have some pork loin that I was planning to grill, but I have made this recipe with beef and it could be done with chicken as well. I had recently picked up some sweet peppers at a nearby farm market (the same one that Amy talked about in her Golden Apple Bars recipe) , and I had a sweet onion as well as a hot onion. I threw in some baby portabella mushrooms, tomatoes and I had all of the fixin’s I needed. I began by putting together my marinade. 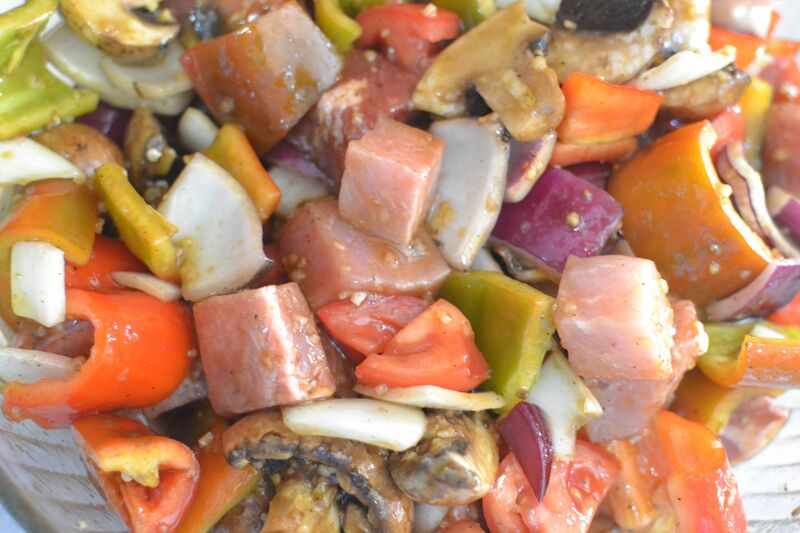 This is a basic marinade that I use for much of my grilling. It’s incredibly simple, too. 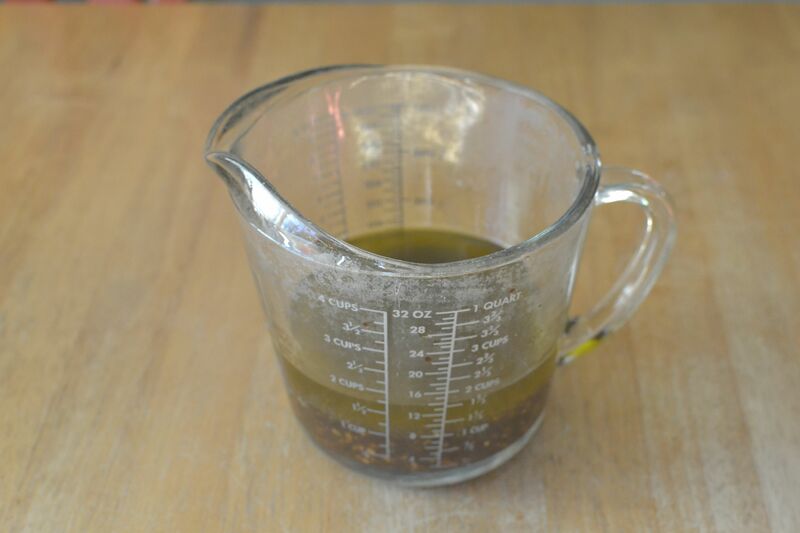 I often modify this marinade, depending on the meat and how large the amount is that I need. For this particular recipe I doubled the marinade, added two tablespoons of teriyaki sauce, and another two teaspoons of soy sauce. I have been known to add things like ginger, mustard powder, onion, or other spices that go well with particular meats. 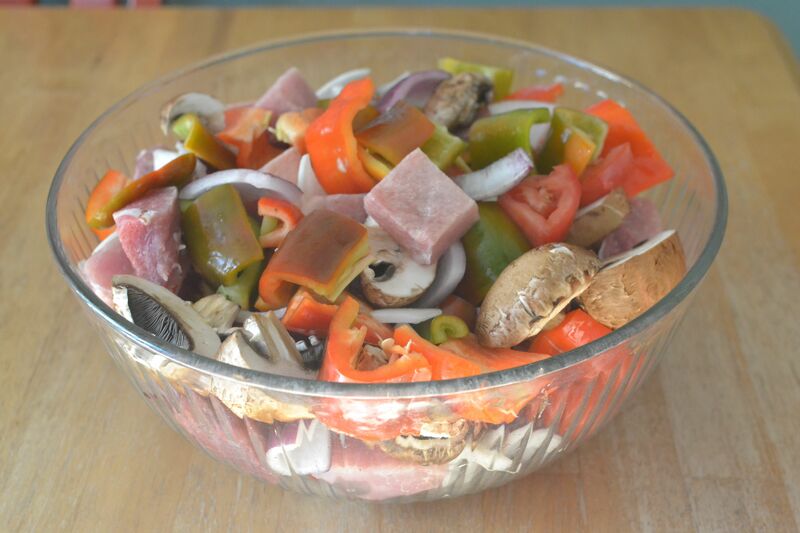 After blending the marinade, I poured it over the large bowl that I cut the onions, peppers, mushrooms, tomatoes and meat into. I stirred the ingredients and placed them in the refrigerator for four hours, shaking up the bowl occasionally. 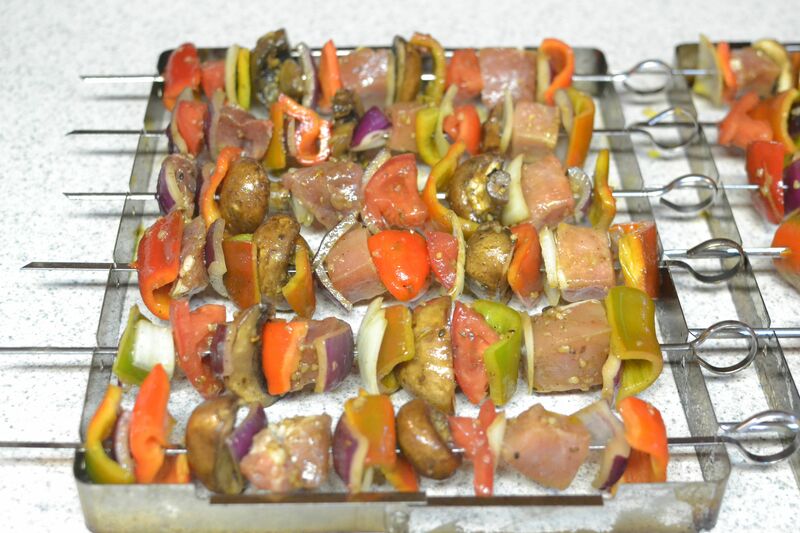 While the grill was preheating, I skewered the meat and vegetables. There is no right or wrong order, but I prefer to put the meat next to onions for the flavor that they give. 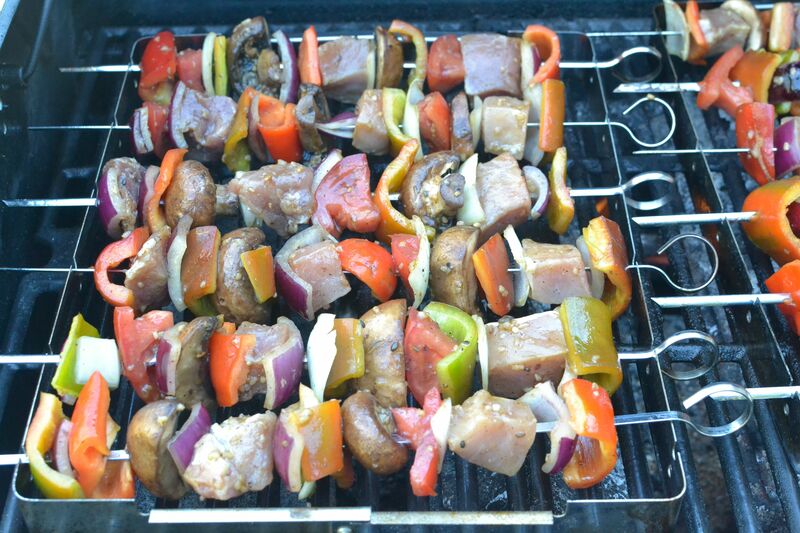 I turned the burners to low, and placed my kabob racks on the grill, turning them occasionally. The low burner temperature allows the vegetables to cook through, without the meat getting over done. I served these with fresh raspberries, pineapple, and a side of rice. The meal was met with rave reviews! My grandpa might not have been happy that I just shared my recipe, but he sure would have been proud! 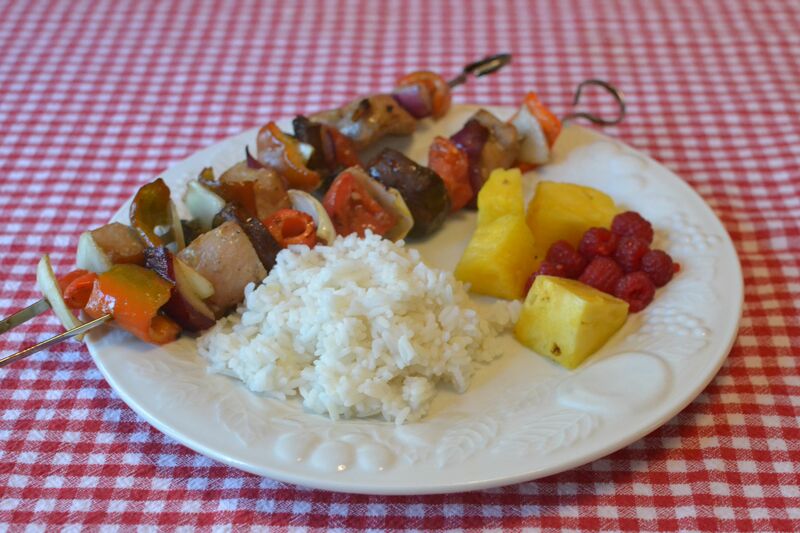 This entry was posted in bonus recipe, Main dishes and tagged Fresh Vegetables, Grilling, homemade, Marinade, Outdoor Cooking, Pork Kabobs, scratch cooking by GrandmothersRecipeBox. Bookmark the permalink.